Our Favorite Acai Bowl Recipe! You’ll love our quick and easy Acai bowl recipe. Loaded with all kinds of really good stuff. Healthy stuff. Lots of fruits, granola, seeds, nuts, a little bit of almond butter, and a little honey. Healthy and delicious? Yes it is good and so good for you! Acai berries are considered to be a Super Food. 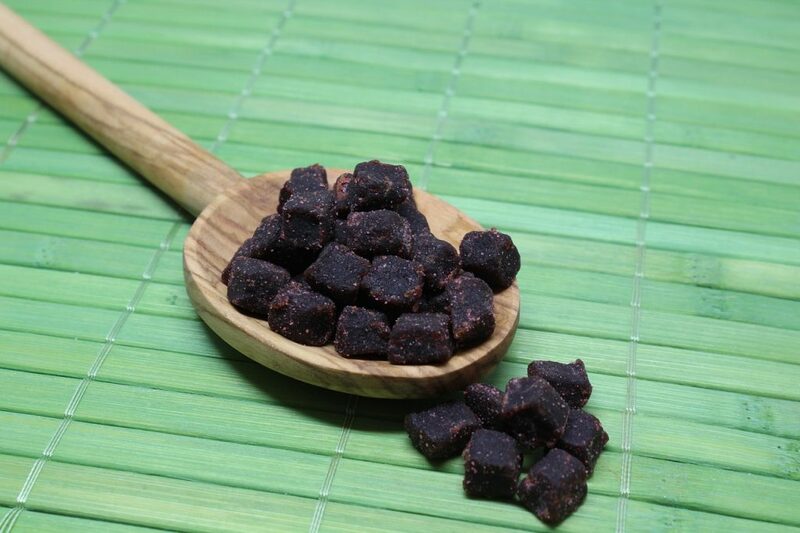 Harvested from Acai palm trees, the Acai berries resemble fruit similar to grapes. Native to South American rainforests, Acai berries contain antioxidants and fiber. The great thing about this Acai bowl recipe is that you can adjust the recipe to your liking. Add the fruits that you like or your kids like. Or add the fruits that are in season at your local market. Or you can add fruits that you happen to have on hand. You can create an Acai bowl stand for family or guests to select from and help themselves with toppings. Once you prepare the base mix, you can pour the fruits, seeds, or toppings to the mix that you want. The base mix can even be frozen and stored in the freezer for another day. An afternoon or after school healthy snack to be enjoyed when you can’t make a fresh meal. A delicious snack on demand stored right in your freezer for healthy eating. This recipe should make 3 to 4 portions. Prepare the following in a blender. Cut one banana into large chunks. Add fresh or frozen pineapple chunks – about 1/3 cup. Add blueberries and strawberries to fruit mixture. 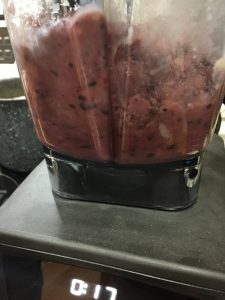 You can use either fresh or frozen blueberries and strawberries. About 1/2 cup each. Next, add mangos to the fruit mixture. Use about 1/3 cup. 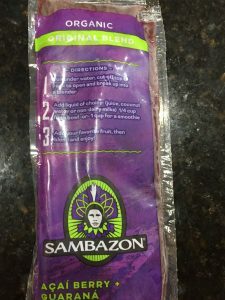 Cut open one Sambazon Acai Berry Guarana frozen package (3.5 ounce). 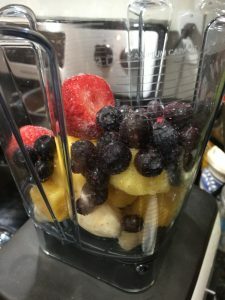 Drop into blender with the other fruits. 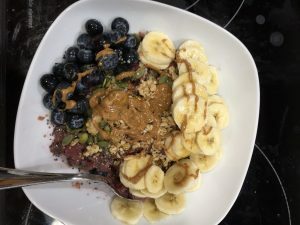 This Acai bowl base recipe is easy to make and can freeze until you are ready to eat. Just remove from the freezer 1-2 hours to defrost. Tip – Break frozen Acai Berry into smaller pieces for easier blending. 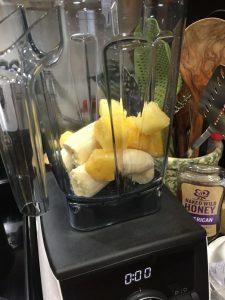 It will help blend with the other ingredients more easily and not tax your blender. Pour Organic Unsweetened Almond Milk into the blender with the other ingredients. Almond Milk is a good alternative to use in place of dairy products. 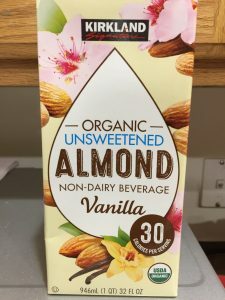 We use about 1/4 cup of Almond Non-Dairy Beverage Vanilla. Mix ingredients in blender for 2 minutes on medium. Once these ingredients are in the blender, you are ready to mix. Mix these ingredients thoroughly and until well blended. Pour Acai Bowl Recipe into 3 or 4 individual serving bowls depending on desired portion size. 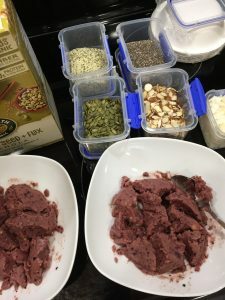 The Acai base mix can be either frozen in individual bowls or be served with toppings. If your Acai base mix is to be frozen be sure to wrap the bowl securely to avoid any drying out. You are almost done. Just need to add your favorite toppings, fruit, a little Almond Butter, and Honey. After Acai and fruits are blended, toppings are ready to be added. Some of the toppings we typically use are granola, seeds, and nuts. Seeds such as pumpkin seeds or pepitas, chia seed, and sunflower seeds are healthy and high in fiber. You can also add hemp hearts, sliced almonds, or shaved coconut. Or maybe you have other toppings that you like to use. Remember, you can adjust this Acai bowl recipe to include your favorite fruits and toppings. If you have a Acai Bowl recipe or toppings that you like, please consider sharing them with us. And if you try this Acai Bowl recipe, let us know how you make out in the comments below! You May Also Enjoy . . . . Check out some of our other recipes. Join 1,000+ Readers on Pinterest! Finding Sea Turtles is a participant in several affiliate programs, which means we may receive a small commission if you make a purchase from the merchants linked via our site.